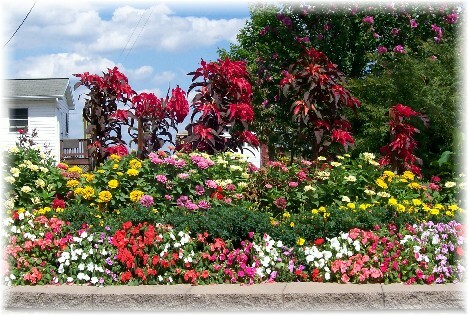 We passed these beautiful flowers yesterday along the road north of New Holland, PA and backed up so Brooksyne could take the photo out of the side window. As we did we so we observed the old order Mennonite couple sitting on their porch pleased at our interest in their flowers! Yesterday we attended a celebration luncheon for Jean Hershey who has a distinction we suppose very, very few have. 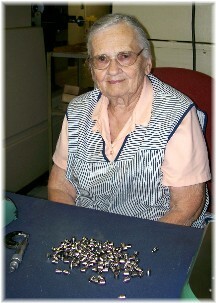 She has worked for the same company for sixty years. Yesterday the company held a luncheon to honor her years of service. Later after the luncheon as I walked by her work station she quipped, "I'd better get back to work or I may be fired." She inspects very small parts that go into mission critical equipment and at 82 years of age she is still quite proficient in her meticulous duties. When I walk by her station, as the company chaplain, I certainly can't distinguish defective materials from acceptable ones. But she can just run her hand through the hundreds of small parts and instantly detect those that will need her careful attention to see if they're acceptable or will need additional adjustment. In the daily Scripture portion the Apostle Paul is addressing slaves. This may be a turnoff to some, but in the text we can learn a very important Biblical principle. Slavery was a common practice throughout much of the Roman world in the New Testament age. Sometimes you may feel like a slave to your boss or employer, but you know better! If you wish you can walk off the job right now, although there would likely be some very consequential ramifications! Paul says to these slaves concerning their work, "Work at it with all your heart." We should apply these same principles in our work ethic toward our employers. In whatever we do, our work should be "as to the Lord." Our underlying motivation is the future inheritance we will receive from the Lord. And what is that inheritance? It's our home in heaven that can "never perish, spoil or fade." When we work with this attitude Scripture teaches us that in some remarkable way it is the Lord Christ whom we are serving even more so than our employer. Today remember that our work matters to God. Assuming that you are not involved in a type of work that is Scripturally immoral, your work and the diligence in which you perform is honoring to God. (If your work is immoral God can miraculously provide another job as you take a spiritual stand and commit the matter to Him.) The very next verse states: "Anyone who does wrong will be repaid for his wrong, and there is no favoritism" (Colossians 3:25). May you experience the joy of the Lord in your work today! Daily Prayer: Father, as we do our work heartily unto You we won't be half-hearted in our service or in our attitudes. Seeking to please You will be our major motivation. Not only in our service do we want to do our best but we also ask You to keep our attitudes in check and our words uplifting in the work place. Help us to be quick to see another co-worker's need and respond accordingly. May we not yield to the temptation of finger-pointing and finding fault with others. Prompt us to be faithful in prayer for our employers, supervisors, co-workers, and the business in which we serve. In Jesus' name we pray. Amen. Interesting note: This same company had a similar celebration when Jean had her 50th service anniversary and at that point she had never had a sick day! We stopped late yesterday afternoon to see our Amish friends who had called us to offer a big pail of fresh string beans and other fresh vegetables. As we visited in the barn Ester took a photo of me with a horse and mule. 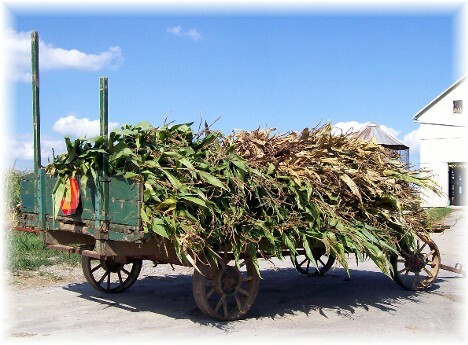 Yesterday the first corn was cut and hauled in from the fields on the wagon to chop up for sileage. 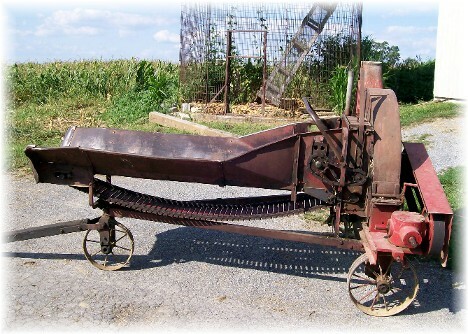 An old fashioned corn chopper still periodicaly used. This photo is not upside down. Any idea what it is? Finally today: Yesterday we passed this interesting sign with some slight mispellings! Is the family moving and selling their "extras"? 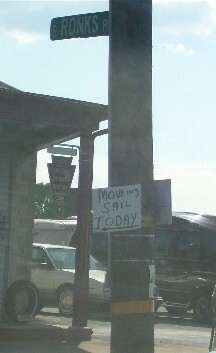 Or are they letting people know that they'll be moving their sailboat today? 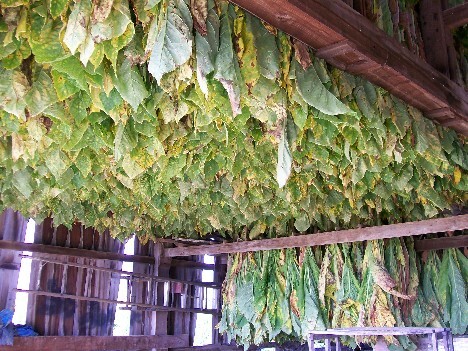 Mystery photo: Today's mystery photo is tobacco hanging in the barn to dry. Please note: We are not endorsing tobacco use! In fact our Amish friend does not grow tobacco but another farmer is using the space in his barn to dry it.